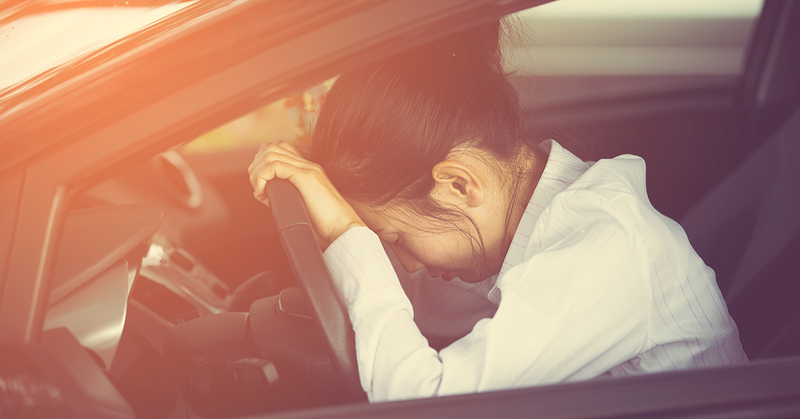 You’re driving through a patch of your market. You know it like the back of your hand. You’ve seen it grow, seen it change. And then you see it…. a For Sale sign…. in the yard…. of a home you helped close just a few years ago. Or maybe it’s the home of a tennis buddy. Or your daughter’s teacher. Whoever they are, the only thing that matters is that they listed their home and -- for whatever reason -- didn’t call you. 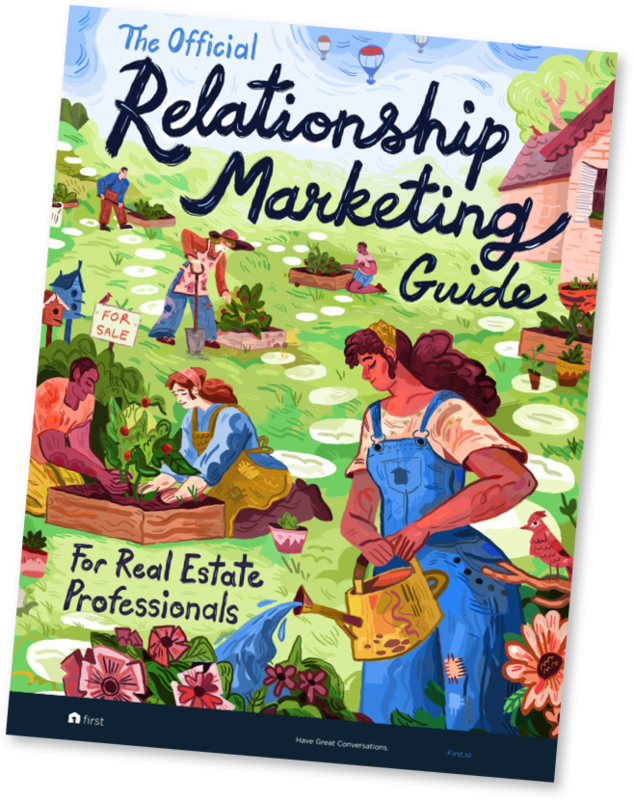 No matter how exciting and enticing lead generation might be, real estate agents get over 70% of their business through relational channels. That means repeat and referral business drives your bottom line. So missing out on a listing from someone you know is doubly frustrating. Not only did that person not think to call you, they probably wouldn’t think to refer you either. Reason 1: You're talking to the right people – at the wrong time. Everyone you know – as in the people in your sphere – is valuable to you. But the fact is this: some are more valuable today. Let’s look at the data. Only 6% of homeowners across the US will sell their home in a given year. You know that staying top of mind and talking to people you know is the best way to get referral and repeat business. But without a system to prioritize your outreach and follow-up, you have, on average, a 6% chance of connecting with an actual seller. Say you want to meet 10 sellers. You're going to need to spend time with at least 166 people. Who has that kind of time? You miss listings from people you know because most of the people you're talking to won't sell this year. Some will refer you business. But that still means you're leaving a ton of potential business on the table. You probably already prioritize. You talk to your A's and B's. You try to talk to your past clients. And you pay someone to harass your leads. But it's clear this strategy isn't working. Just look at the numbers for past clients. According to NAR, even though 70% of homeowners say they would definitely work with their agent again, and 15% said they probably would, only 25% actually listed with their former agent. Sure you're sending your past clients a newsletter, but clearly, that's not enough to convince most people to work with you again (and, sadly those magnets aren’t going to convince them either). You could triple your business just by connecting with your past clients at the right time. And that's just one segment of your sphere. 72% of sellers selected the first agent they contacted. That means that once a homeowner does decide to connect with you, if they're ready to sell, you have a very good chance of winning the listing. And yet, only 4% of sellers choose to work with a new agent because they called, texted, or emailed at the right time. In short, you know a lot of people. Some of them will sell. But most of the time, you're talking to the ones who won't. How to fix it yourself: Use the data you have to try to drive better decisions. Look at factors beyond time in the home. Look at life changes and external circumstances, such as marriage, divorce, school districting and resources. It's a lot of work, but you need a system to prioritize your time, otherwise you'll spend most of your time with people who aren't likely to sell. 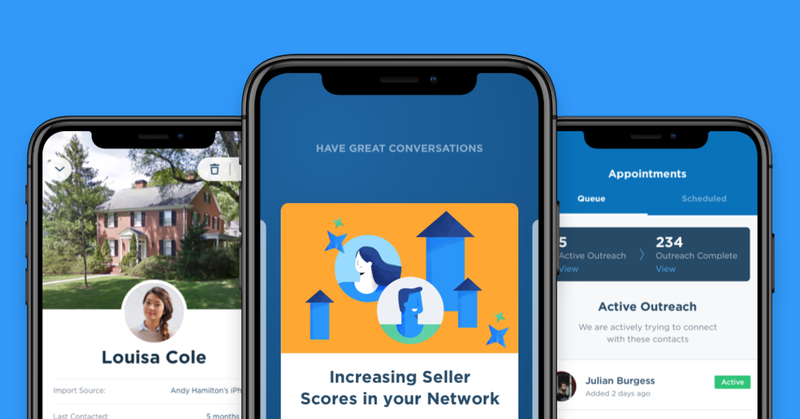 How to fix it with FIRST: Use First to access over 700 signals from over 214 million people, finding patterns of behavior that indicate your contact’s likelihood to sell. If you focus on people First identifies as likely sellers, you now only need to meet with 40 people to get to 10 listings. That's doable. 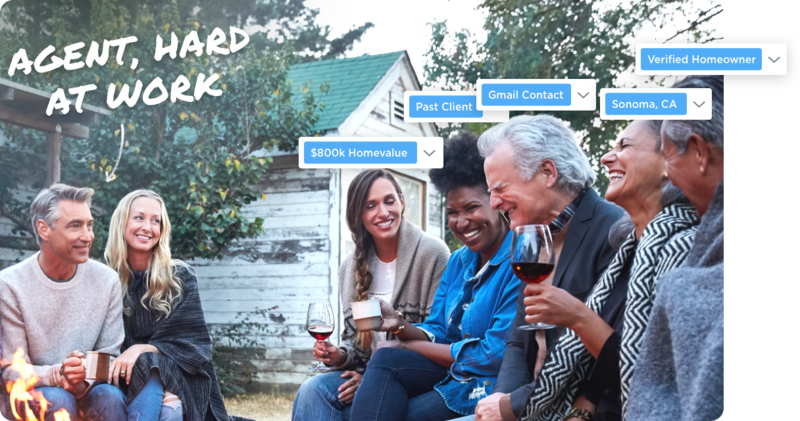 First also sends reminders and recommendations to alert you as the people you know become more likely to sell soon. With First, you'll never say "I had no idea" again. Reason 2: You're not following up consistently. According to Zillow, trust is the #1 factor for sellers when choosing an agent. 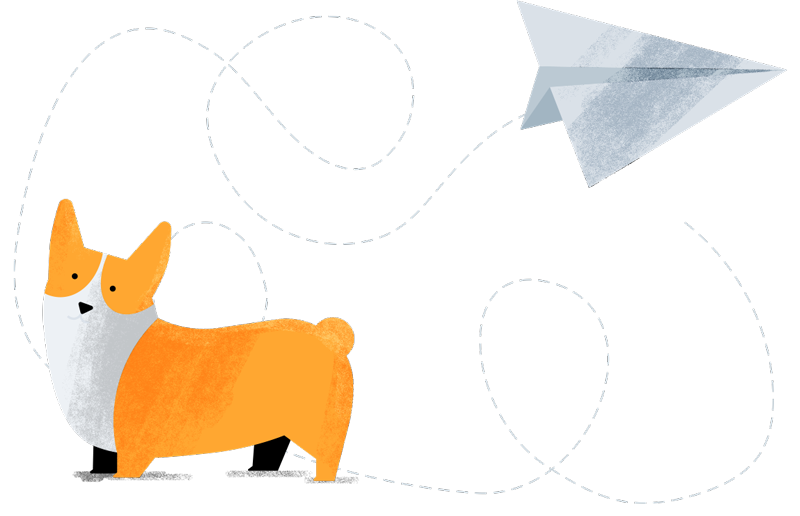 Trust isn't built through email. It's not built through a newsletter. It's not built with Facebook posts or postcards. And it's definitely not built through an ISA team. Trust is built through relationships. And relationships take time and consistent investments into nurturing them. That means you need to show up. Be valuable. You need to spend time one-on-one and build trust with people before they start thinking about selling. People need to trust that you know what you're doing, that you know their market and understand how to market their home to the right buyers. But they also want to know that you understand them, who they are as people, and what they need to make the home selling process good for them. How to fix it yourself: There are a number of systems and processes out there for agents trying to stay in touch with their network (we also have recommendations on how to get back in touch). One of our favorites is Stacy Staub's Stay-in-Touch Checklist. How to fix it with FIRST: First makes it easy for busy agents to stay on track and in touch with their network. 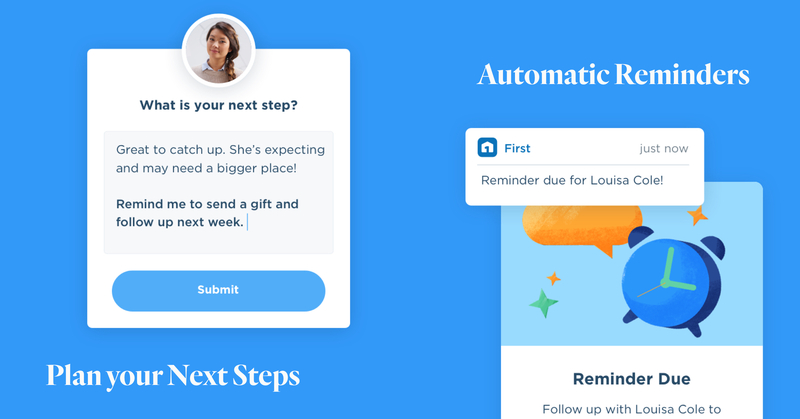 Our Next Steps feature helps you go beyond casual conversation and move your relationships forward by setting personalized Next Steps for each of your contacts. We also take it a step further by enabling you to send customized reminders right to your phone. Reason 3: You're starting the wrong conversations. Imagine you have a friend who is a surgeon. And every time she sees you, she asks if you or someone you know needs a procedure. Or say you know a lawyer, and he only asks if you need legal advice. Realtors have to walk a fine line. Real estate is a people business. And as an agent, you are your brand. So you’re happy and willing to talk real estate anytime, anywhere. Who wants to be that agent who *only* talks about real estate? Who *only* reaches out to ask, “Are you or someone you know ready to buy or sell?” That’s not being a person. That’s being an automaton. And real estate is a relationship business above all else. That’s why ‘leads’ can seem so much easier to deal with. These are people you don’t know yet, so you might feel more comfortable talking strictly about real estate. But when you're talking with people you do know, you shouldn't be so single minded. It makes you less personable. Less valuable. And less genuine. The data is in your favor! Over 80% of buyers and sellers would work with their agent again. That means they enjoyed the relationship. Homeowners value their agent as a trusted advisor. And would work with that agent again, if only the agent stayed in touch. If you don’t stay in touch because you don’t want to be a jerk, it’s no wonder you missed the listing. You're a person first. Agent second. How to fix it yourself: Don’t talk about real estate all the time! Be a person first. Have conversations. Build relationships. How to fix it with FIRST: Well, First can’t help you with this part. First will get you to the right people at the right time. But the rest is up to you!